Whether you’re new to English Country Dancing or already an enthusiast, we want to empower you with the resources to begin dancing, teach others, and have fun with friends! If you’re new to English Country Dancing, (or you don’t even know what it is), you’ll find everything you’ll need to begin taking your first steps on this website. From learning the steps and dances to what you should expect at your first ball and how to connect with a dancing group in your own area. 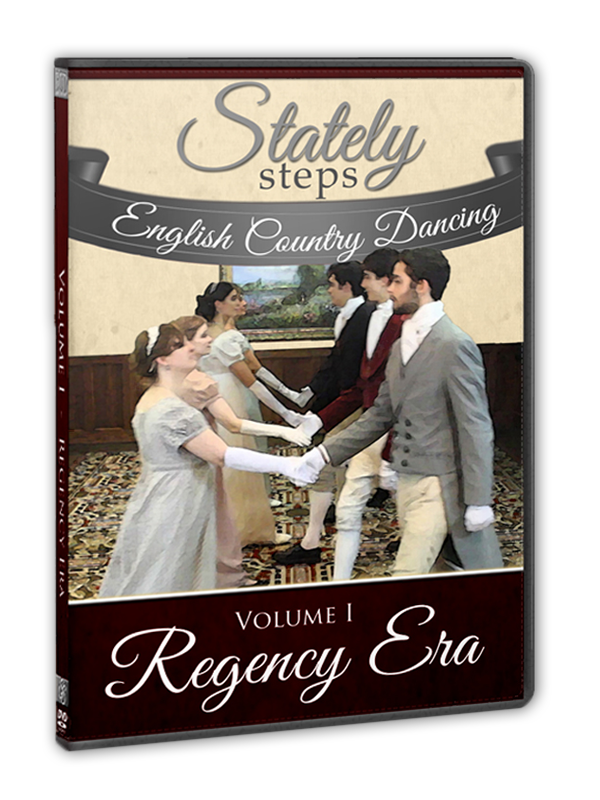 By utilizing our resource center and products in the Stately Steps shop, you’ll be able to take your love for English Country Dancing to a whole new level! You’ll find all of the resources that you’ll need to teach your friends – and maybe even start your own dancing group! Learn the basics of English Country Dancing with a the “Introduction to English Country Dancing” video segment. Each step is individually broken down and demonstrated before each dance. Practice dances before your next ball – from the comfort of your living room! Follow along with the dancers in the video, along with on-screen prompts and calls from your virtual dance caller! “Your work is splendid. The arrangement of costumed dancers and animated diagrams step by step are clear and beautiful.” Dr. John R.
“Thank you for your wonderful Regency dance DVD. Having written a Regency romance, I practiced up on Mr. Beveridge’s Maggot to teach it at my book launch party! Everyone had a great time…Thank you!” Christina D.
“I ordered the DVD and CD for an avid fan of Jane Austen’s work and of the Regency Era in history. She IS THRILLED with your instructional DVD and said the music is also beautiful! She found the DVD to be a wonderful tool and said it was just what she was looking & hoping for!” Alex R.
Enjoyed by hundreds of dancers all around the world!